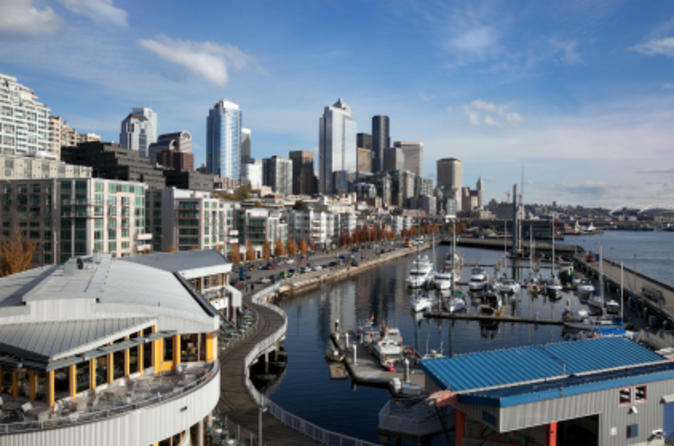 Making a short stop in Seattle before embarking on a cruise? Take this three-hour pre-cruise tour of Seattle and discover the best of the beautiful Emerald City! You’ll cover 50 miles in a comfortable, small-group mini-coach and enjoy the views of the city’s most iconic attractions, such as Mt Rainier, the Space Needle, Pike Place Market and much more. No need to worry -- your guide will pick you up at your Seattle or SeaTac area hotel, take care of your luggage, and drop you off at Seattle’s cruise terminal with plenty of time to board your cruise. Make the most of your short stop in Seattle and enjoy this three-hour city tour highlighting all the sights that make Seattle so unique. Your guide will take care of your luggage and give you a comprehensive tour of downtown Seattle and the surrounding neighborhoods. You’ll see such famous sights as the Space Needle, Pike Place Market and Chinatown while admiring views of Puget Sound, Olympic Mountains and Mt Rainier! Don’t worry about missing your cruise; your guide will make sure you arrive in time to board your ship. See Itinerary Section below for the list of sights you’ll see on this pre-cruise Seattle city tour. We will ensure your timely return to the Seattle port for this activity. In the rare event your ship has departed, we will arrange for transportation to the next port-of call. If your ship is delayed and you are unable to attend this activity, your money will be refunded. See our terms and conditions for full details.